Send Gifts to Thank Israeli Soldiers! are not US tax deductible. 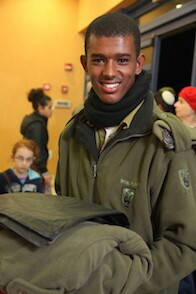 Your participation in the IDF Warm Winter Campaign will provide Israeli soldiers with the winter gear that they desperately need. We are honored to thank the young men and women of the IDF who risk their lives to protect the citizens of Israel. Gifts to Israeli soldiers are not tax deductible in the USA. Send your gift and personal note to a soldier today! keep an entire army unit warm by ordering 10 packages. The soldiers greatly appreciate your love and concern! Keep a soldier warm this winter with a much needed and appreciated army regulation fleece jacket. You can make an entire army unit very happy by ordering 10 jackets. Brighten up a soldier's day by providing vital winter wear including a fleece jacket, hat, gloves and neck warmer. You can make an entire army unit's winter extra special and warm by ordering 10 deluxe packages. Warm Up a Battalion of 100 Soldiers! of wool hats, gloves, neck warmers and fleece jackets. Select the package of your choice. All gifts are greatly appreciated by the soldiers. your donation to be allocated. Thank you! You chose credit card. CLICK HERE for Paypal. ↑ This field is required.